60 minutes of driving, 35 minutes of hiking, and 90 minutes of parawaiting - For 6 minutes of flying? Cuesta April 2010 from Tim O'Neill on Vimeo. that you would like to see included. Some competitions utilize variations of the formats mentioned so far. I’ll mention a few here so that they are not a complete surprise when they are utilized. If any of these options are exercised you can expect some explanation from the CD to answer questions at the Pilot Meeting. Alternate Tasks – Occasionally, when weather conditions are in transition, the Task Committee will build an “A” task and a “B” task. Each task fits weather conditions that may develop. The Task Committee will call the appropriate task at a later pilot meeting when the weather forecast is more developed. A good strategy is to write down each task with all details, then program both into your GPS. When the task is called, you can make the appropriate route a competition route, and/or activate that route. Multiple Start Gates – When the Task Committee considers it necessary, a start with multiple start times, or gates, will be specified. A “first” gate at 1 PM may be specified with 15 minute intervals between gates, and the last start at 2:15 – for example. What this means to you is that you can choose to start the task any time after 1 PM. 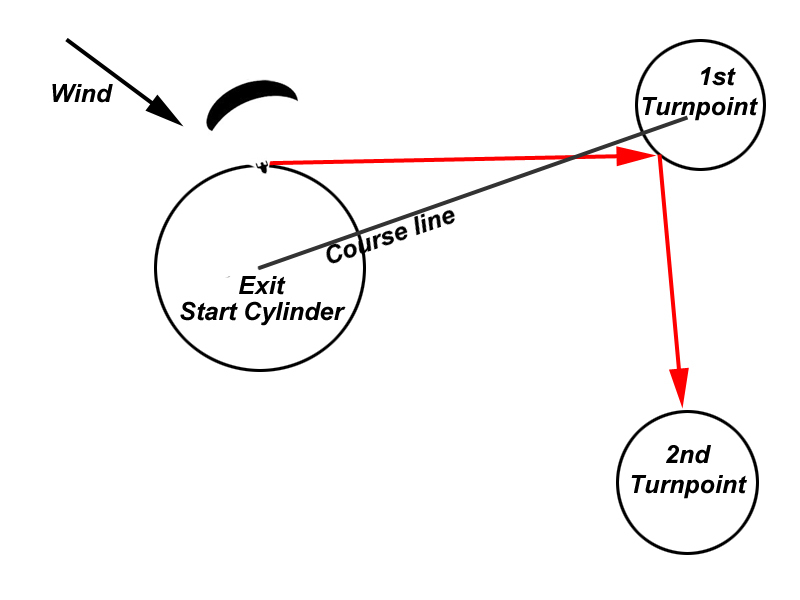 Your elapsed time for the task will be computed from the time of the last start gate time that expired prior to you leaving the start cylinder. This format can provide some strategic opportunities including: Choosing the gaggle you’d like to fly with; Flying out on course, and then returning for a later start gate (if conditions become stronger for example) etc. Ground Starts – At large launch sites this option can be used and is quite a sight. At the “start” time all participants launch and begin the task. Elapsed time begins at the start-time. These are generally not seen in the USA. Open Distance – The XC Open series uses this format. Instead of a task committee setting your waypoints and goal, you choose the turn-points. There is no goal other than the horizon. Flying these tasks can be less stressful, but also has less ‘mano-a-mano’ feel. Class Racing – Most competitions have an “OPEN” class and a “SERIAL” class. Some also include a “SPORT” class. Serial Class includes EN-D wings and Sport Class includes EN-C, B, or A. Usually all pilots, in all classes, will fly the same task. Scoring is not handicapped or given premium based on class. Handicapped Racing – Some competitions use a handicapped score to allow pilots of low experience and flying low performance wings to score a ‘value plus’ score. This type of scoring is sometimes used in Open Distance type of tasks and is useful in Team scoring. SPOT – The SPOT unit is a valuable piece of kit when flying XC. Unlike cell-phones, it uses satellite phone technology to make a graduated request for aid. I think it is cheap insurance. Tree Kit - I carry a home-made kit similar to the kit in this article from www.towmeup.com. Survival Kit – I carry a kit with the items listed in my article. Water – I carry a 2 liter water bladder in my harness and 1 or 2 additional liters in my pack. Oxygen – Many competitions are held in mountain sites where it is not uncommon to get over 15,000’. A pilot’s performance is noticeably affected when at high altitude for any length of time. Oxygen also helps the pilot stay warm when properly oxygenated. Your task is to tie this all together. The difference between Cross Country flying and flying Cross Country Tasks is similar to the difference between waterskiing around the lake for fun and skiing a slalom course at a prescribed speed. Flying an XC task requires specific skills, preparation, planning, and strategy. The best way to build the skills and learn the strategies required to fly in comps, is to fly comps. It is a specialized skill-set that, when you achieve a level of competence, leads to understanding and competence that carries over into your non-comp flying. The trickiest time, in your XC competition ‘career,’ will be your first 3-4 competitions. Your experience is lacking, while your enthusiasm and competitive drive are high. Many pilots are of the opinion that flying comps is dangerous. I disagree. Flying beyond your experience is dangerous. Flying wings that you are unable to fly competently is foolhardy. Competition pilots are some of the most experienced and safety-minded pilots you will meet. Make a concerted effort to be a safe and mature competitor, and your longevity will guarantee you a degree of success. You can begin by choosing to fly a wing that you are comfortable on. 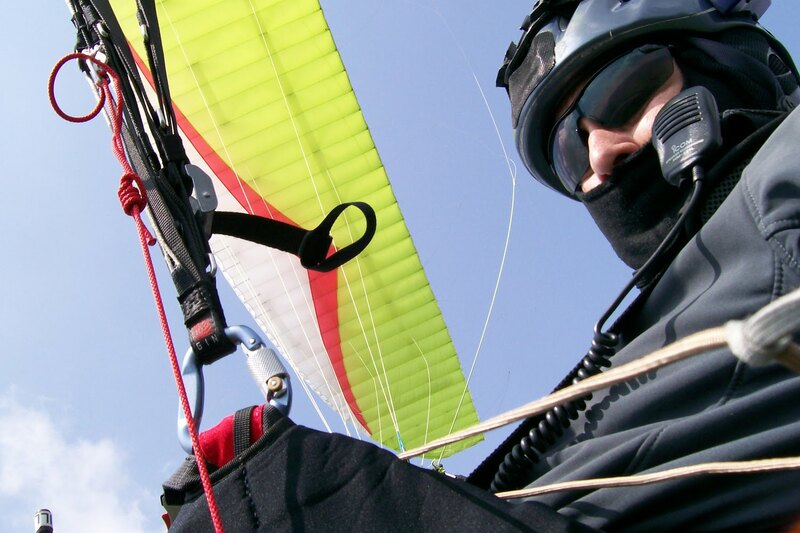 Get experience flying in thermal conditions and launching in variable winds. Practice your wing control so you are comfortable on launch. Each landing should be planned and controlled. When LZs are scarce, don’t “put yourself in a corner” where there are no good options. In short – Use your head. Remember that this is not your livelihood. It is simply, an ‘optional’ activity. When you begin to fly XC comps your primary goal should be to fly each task as safely and successfully as possible. Don’t try to race. Make every attempt to fly with a gaggle to cover the miles and make it to goal. Making goal equates to success. When you land short of goal you should try to learn from the experience. How did others get through that area? Could you have increased your chances? I’ve found that writing up a debrief of each flight has future value when reviewing flights. Expectations to learn are good since, even if you land short of goal, you will have valuable lessons to learn. Be a student of the game. 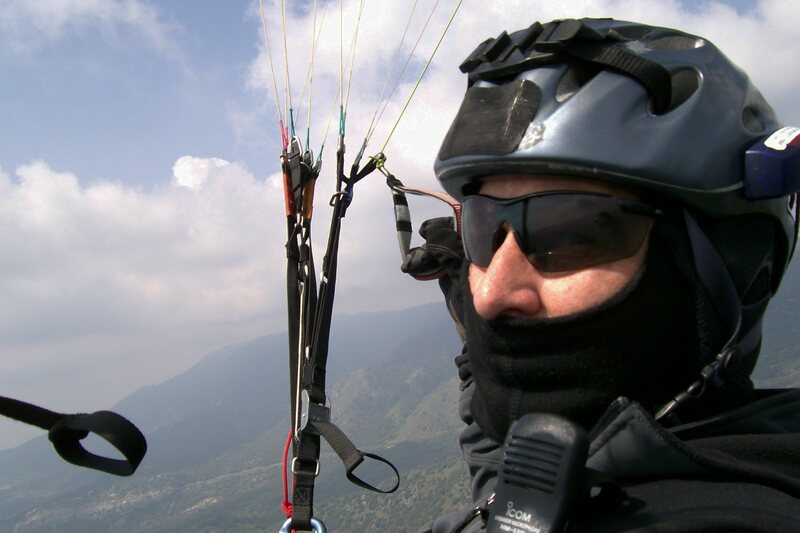 You will soon understand that a paraglider competition task is like a road-bike race where cooperation and courtesy are important to your success. The real race doesn’t begin until that last thermal when everyone in the lead gaggle is computing their glide to goal. The pilot with the fastest wing, with the best glide, and the most accurate final glide computation (not to mention largest cojones), wins. Your strategy is different. Your goal is to fly with a gaggle of similar performance pilots and wings to work your way around the course to goal. As your skill improves you will find that the company you keep will be of better quality. There are many learning opportunities during the competitions. If Mentoring is offered, take the time to ask questions and discuss mistakes with your Mentor. Take the opportunity to talk with the successful pilots when it presents itself. Be sensitive to timing and don’t be a distraction when the pilots are setting up for a task. Beer seems to be a good trade for expertise. Some pilots are more conversational than others, but we all know that new pilots have questions and we are happy to work with them. Each of us has our own goals. This sport has so many layers of challenge that ‘mastering’ XC competitions is quite a lofty goal. Even pilots who have flown competitively for decades have bad days and make the occasional mistake. The trick is to make less mistakes than you did last flight, each time you fly. When you have your gear set-up correctly, when you know how to use your electronics to your best advantage, and when your flying skills and strategy are optimum for the day, you will fly a ‘good task’ to goal – the feeling of accomplishment is very rewarding. Your rank is a secondary measurement to that of the joy you feel. Hang-on, because NOW you are hooked. Click on photos to view the images at full size. with a hazy launch in the backgroundThis week 4 of us from the San Luis Obispo area headed to Dunlap to fly. 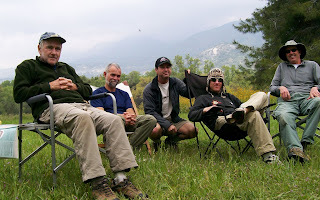 We arrived Wed., around noon, and set up camp at the Dunlap Flight Park (Dan's Place). Greg made us feel welcome and offered to drive us to launch. 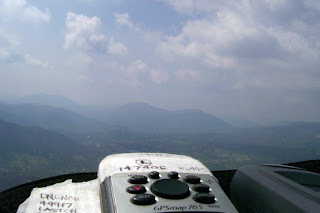 The weather was classic Spring cu's with cloudbase around 4500-5000'. Mike was new to the site, so Patrick gave him a site- brief while David and I set up. I launched first and went to cloudbase almost immediately. The rest of the crew launched and we all enjoyed the buoyant conditions. I headed across to Granny's knob and then got snookered coming back to the main ridge. I landed at the base of the ridge. By then everybody but Patrick was on the ground and Patrick had come over to land, so I suggested we go back up for another flight. The second flight was nice. Conditions had mellowed and cloudbase had gone up to 6000'. I headed over to Hill 49917 and explored the various cores over the peaks to find the bullet that, eventually, took me to cloudbase. Then I headed for Bald Mountain and flew all the way to the West face to extract as much lift as possible there before heading for Dan's. I didn't realize the amount of altitude that I had expected over Bald, so it was a bit 'iffy' whether I would make the final glide to Dan's (about 8K) without a little more lift. I milked everything I could out of the glide, but still was planning a landing behind the restaurant, when I found a 100'min bubble. I circled about 15 times in the fickle lift, while drifting downwind, and this allowed a nice approach to the main LZ at Dan's. Mike had a beer for me and soon we were gathered around the BBQ telling tales. Thursday we headed to another site to fly with Tom M. It's a site with limited access, so let's just call it no-name. The launch was a very intimidating granite dome that tailed off into a 1000' vertical face. There were two primary spots to launch. One had more space to turn and run at the cliff - but it had a 5' by 5'tall tree to negotiate at the lip. I chose a rather tighter spot with about 6' of granite between me and the cliff while pulling up. I launched first and the pull up and turn went well, I had good pressure in the wing and took two steps into the void. I had an immediate good climb to the low cloudbase (about 400' over launch) but got flushed in a down cycle and, after a 15 minute scratchfest, landed in a tight meadow at the base of the hill. Dave and Patrick and Tom all launched shortly thereafter, into a nice sunny period and made it Northwest along the ridge, and landed in big fields out there. It was an enjoyable day and fun to explore a new launch site. Friday we awoke to scattered clouds and a nice forecast of clear skies. XC skies gave no hints of high humidities and overdevelopment. Bruce B. had joined the party Thursday night and Mike, Patrick, and Bruce all headed up to launch to get an early flight while Dave & I broke down the pop-up trailer. Unfortunately the entire Dunlap valley filled with convective cloud and base was 100' below launch. The boys headed back down to camp and decided, after a time, to head home. At around 1:30, Dave and I got a ride with Greg to the top and conditions were just beginning to improve with nice blue gaps between the healthy cu's. We set up and launched to fly with the thermal-birds (swallows) in the improving conditions. Eventually we both had had enough fun & knew we had a drive ahead of us, so we landed at Dan's and headed home. In all it was a great three days. No epic flights, but nice company, enjoyable times, and many safe landings. The scope of this article is that of supplying information for use by new pilots in competition flying. For that reason, I will discuss flying tasks as a new pilot on a lower/mid performance wing. The strategies one uses when beginning are different than when the pilot has the skills and wing performance to stay in contact with the lead gaggle. For now, your goal is to make as few mistakes as possible during the task. You are here, not to win the competition, but to Learn and have Fun. You can maximize your learning opportunities, score, and your fun, by make it to goal. I caution you to not let your competitive juices get the better of you. While getting carried away in a weekend soccer game can leave you sore and bruised, making decisions that put you in harm’s way during a PG event can have much more serious consequences. Use your head so you may fly another day. It is a valid strategy, at this point in your flying, to be a follower and fly with the gaggles around the course. Flying with friends increases your odds for making it along the course. Racing along at your own pace, alone, is just about guaranteed to put you on the dirt, or in holes that slow your speed considerably. Once the task has been programmed into your GPS and you have a moment to look at your map, take a moment to plan your flight. It’s a given that you will need some key climbs during the task. You can depend on luck, others showing you the lift sources, or you do your own strategizing. As an example, if the top-of-lift for the day is planned to be 2,500 meters, and the ‘lift-band’ is roughly 2000 meters deep (In other words, below 500 meters you would be in danger of bombing out due to lift being broken or weak below 500meters) then you will have transitions (at a glide ratio of 6:1) of no more than (2000 meters X 6) or 12 Kilometers. To fly a 50 Km. task you will need at least 5 full climbs, or more partial climbs to make it to goal. Plan these climbs by looking for lift sources, spaced accordingly along your route. Keep in mind the forecast winds for the day. You should also look for potential ‘crux points’ along the route so you can plan to attack this portion of the task with other pilots to increase your odds of completing the transition successfully. I’ve already discussed launch organization a bit and you shouldn’t underestimate the importance of your decision regarding launch timing. Generally, I recommend launching shortly after the wind techs have demonstrated that there is sufficient lift to stay in the air. It works out well to launch 30 to 45 minutes before the start time. If it is obvious that you will have traffic in the queue and/or the weather conditions are variable, you may want to be suited up and ready to launch early, so you can take advantage of any launchable window. I’ve seen very experienced pilots loose a task before they even launched, by delaying their launch for one reason or another, only to have the wind turn and make the launch impossible or excruciatingly slow. Remember that you will need to consider your rank in the ordered launch to decide whether to wait or use the open launch period. If in doubt, get in the air at your earliest opportunity. Once in the air, I do a quick inventory to make sure my instruments are all working properly, speed system is working correctly, water source is OK, and that the condom catheter is un-kinked. Spend time exploring the immediate area around the start cylinder for lift triggers and note the wind direction and speed. All this information is data that is useful in planning your start. At this time you also want to get to the top of lift and stay there. The best pilots have a knack of getting high and staying there, prior to the start. 10-15 minutes before the start you want to get serious about putting yourself in the optimum position for your start. Ideally your start should take place at the optimum edge of the start cylinder, just after the start time expires. The optimum edge is determined primarily by the wind. You want to place yourself upwind of the course line if possible. As the Start-time approaches, you need to remember one very important thing – It is better to be late across the line than to cross early. If you do cross the start cylinder early, or if there is ANY doubt, do a quick turn back and re-cross the line. You will receive no points for the day if you blow the start and continue on course. 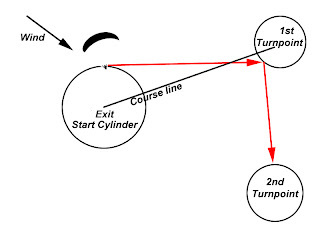 The graphic shows an example of flying the optimum route to the first and second turnpoint after the start. By flying the optimum (red) line you have effectively shortened the route and turned the cross wind into as much of a tailwind as possible. By noting your groundspeed, as you approach the start cylinder, you can use the Start Planning Chart in the appendix to help you judge your time to cross. Back to the start for a moment: If you find yourself low and/or out of position for the start, don’t get frustrated and desperate. We’ve all had bad starts. Take the time necessary to get up and make a reasonable start. Remember that you are not ‘ahead’ if you are the lowest glider in the valley – you’re just LOW. Take your time and don’t compound error. Once you are on course, you are flying with the intention of incrementally advancing along the route. Don’t let the specter of the distance intimidate you. Just keep on working your way from climb to climb. On transitions you should spread out so that you and your gaggle-mates can cover a large search area for lift. When you see someone turn, wait a bit and verify they are going up, before moving to them. While you are looking at the task in short increments, it is also important to keep the “big picture” in mind also. By that I mean that a good pilot is looking down the course, at wings preceding her, and also anticipating the conditions as they change with time. Pace is very important to successful execution of the flight. Some stretches can be flown fast when the lift is strong and abundant. Other transitions will require a deft touch and the use of every scrap of lift. Sensing this change in pace is very important in longer tasks that fly through many micro-climates and into the later portions of the day. One way to learn this pacing is to work with more experienced pilots. When they slow down, you should do so also. Don’t give up when things look bleak. As long as you keep yourself in the air, you have a chance to get back up. Don’t wait until you are desperately low before you begin to work every foot out of the available lift. Remember that the bubble that is teasing you may turn into a fully developed thermal core in 100 meters. Always work towards getting up. Never go on a “Death-Glide” when you have the option of gliding to a lift source. It can even make sense to back-track to a lift source, if the best odds for survival are located there. When you are a thermal or two from goal you should be looking at your final glide calculation. The big-boys are going to work this out down to the millimeter and then play chicken with each other until one blinks & starts his final glide on full speed-bar. You are going to be a bit more conservative and make it to goal with some altitude so you can bask in your glory before landing ;-) Keep your distance to goal in mind, even prior to the last turnpoint, so you can have a good idea when to begin your final glide. You should have a good idea of your L/D Over the Ground, when heading in the direction of goal, so you can come up with a number (altitude or L/D req’d to Goal) where is will be possible to begin your final glide. Don’t get in a hurry and make up an optimistic number – I’ve landed 1K short of goal after a 3 hour flight – it’s not fun. Give yourself a guaranteed final glide & relax as you head into goal – it feels marvelous! Most Goal Lines are a cylinder around a waypoint (like any other turnpoint) however many will have goal as a 400meter cylinder with a 1Km End of Speed Section (ESS). What this means to you is that when you make goal, your speed will be the average speed between the start and the ESS point. You can stop ‘racing’ at 1K – You DO, however, need to cross the 400m cylinder to get your full points (speed, leading, etc.) Don’t forget to proceed all the way to goal, and don’t race on bar if it looks doubtful that you will make it all the way to the 400m cylinder. The primary differences, between Large Competitions and those held regionally, are those of scale. The flying venues are sites that can accommodate many pilots at launch, and any gathering of pilots will see over 100 in the room rather than the 20-30 at League events. For this reason you will find more organization to the administrative side of larger comps. At the top of the pyramid is the Competition Director (CD). The CD has the responsibility to deal with any issues that come up during the competition. To take some of the load off the CD, committees are formed with committee members chosen from the pilot group. Usually the committees are the Task committee, Protest committee, and Safety committee. Each of these committees consist of appointed pilots who have XC experience in the area and the respect of their fellow pilots. The Task committee: The goal of the Task committee is to use the day’s forecast to produce a task that is challenging, possible by a percentage of the field, and safe. The Protest committee: Fields protests regarding all issues regarding procedures, scoring, penalties, and misconduct. Protests are relatively rare and not considered by the committee unless a timely, written protest is filed and a protest fee (determined prior to the first task) is paid. The fee is only returned if the protest is ruled in favor of the protestor. The Safety committee: Input from members of the Safety committee is considered by the CD in making decisions regarding launch safety, safety on course, and important decisions regarding flying the task vs. cancelling or stopping the task. Don’t be intimidated by the size of the field or the quality of the pilots and their exotic wings. The higher the quality of the field, the more learning opportunities there will be for you. The websites for larger comps are less oriented towards the ‘new’ pilot. If you desire information about the flying venue, you will have to do the exploration using Google Earth or similar map program. The waypoint files will be loaded into your GPS units at the competition briefing by the scorer. It will also include your pilot number as a unique waypoint in the unit. You can make the scorer’s job easier by clearing all routes and waypoints from your instruments prior to arrival at the scorer’s table. If you have an ‘exotic’ GPS unit, I would recommend that you bring the cable for the unit with you, in case the scorer does not have a cable for your unit. If it is new and exotic, you might send an email to the Competition Director asking if your instrument will be supported. It is essential that your NAME and PILOT NUMBER are visible on the flight instrument case. The Competition Director will hold a mandatory Pilot Meeting the evening before the competition begins. Bring your Instruments and notepad to this meeting. You will be checked in and given some type of bag-tag or card with your pilot #. It will also include phone #s for the competition staff and emergency contacts. Transportation to the launch site is usually provided and the cost is included in the entrance fee. Retrieves are usually included in the entrance fee. All of the caveats relating to “Good Form” still apply. As a new guy though, try to find a helpful pilot with some experience to answer your questions. In the US, a great first ‘BIG’ competition is the “Rat Race” put on by the Haley’s in Ruch, Oregon. They have a well developed Mentor Program that is designed to help novice XC competition pilots participate safely. Usually a big comp. will have a Launch Window based upon your standing in the competition. For example; The meet director may announce that Launch Opens at 12:30PM with Ranked Launch beginning at 1PM. For you this means that you will have the opportunity to launch early, without restriction, until 1PM. After 1PM your ranking in the comp will allow all pilots with a higher ranked score to pass you in the queue. The possibility of being stuck in the queue is quite high for a low ranked pilot, after Ranked Launch begins. To ensure that the meet director knows who is flying, you are required to check in when ready to launch. This safety precaution is imperative to guarantee that all pilots are accounted for at the end of the day. It is absolutely essential that you check in at the end of your day to notify the Competition Director that you are down and safe. Even if you bomb-out and end your day in the LZ, 20 minutes before the start of the race, you MUST check in and submit your track at the end of the day. There is always somebody who forgets this and causes grief for the CD - Don't be this guy. Some competitions, because the logistics allow for easy transport from the LZ to launch, will allow a “RELAUNCH”. This option may have specific times and rules associated with it. Have a plan if you are in danger of landing in the LZ. Sometimes it is advantageous to land rather than miss the relaunch shuttle because you tried to pull off a low save in vain. You are not required to enter the competition to act as a wind tech. This saves you the cost of entry and is an option if you can only participate in a few days of the scheduled competition. You will see the workings of the competition and how your fellow pilots prepare. You will have the chance to fly with the competition pilots prior to the start of the task. Your flying will not have the perceived pressure of competition, but you will gain some experience just by attending and flying the event site. You will not be scored and, generally, not allowed to fly the course. You are looking at the event from the outside in. This may have you gleaning less experiential value than if you were to actually fly the competition. Your flying is “at the pleasure” Competition Director. You will be told when to launch. It will be timed well before Launch Opens and timed so that the air can be sampled for start planning and safety considerations. You may not qualify for a free retrieve. Remember that your flying is allowed so you can be of service to the competition by demonstrating and reporting the type of day it is. Both the competition pilots and Competition Director will be using your flight, and those of other Wind Techs, to gauge the wind, and the quality of the day. Remember that a request by CD to launch is just that – a request. YOU must determine the safety of your launch. Consider the conditions and your experience when deciding to fly. I’ve seen wind techs launch in conditions that many of the comp pilots were uncomfortable with. Safety is an acceptable reason to refuse a request to launch from the CD. Remember that the participants all paid an entrance fee to fly in the event. Fly in a way that is helpful and uncompetitive. You should always consider the comp pilots when they are looking for seats in the van to launch, in your thermal, or jockeying for position for the start. I’d say that 5 to 10 minutes before the start a wind tech should not hinder any other pilots. Don’t expect to fly the task and don’t turn in your GPS for scoring.